How Do I Buy Wales v France Rugby Tickets? .... available to order NOW! TicketsRugby is NOT linked to the WRU & is not approved or endorsed by them. 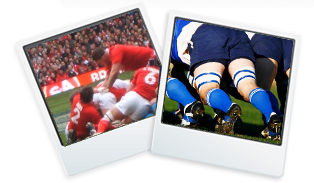 Wales v France rugby tickets Wales Rugby Union (WRU) have played France Rugby Union (FFR) 94 times (Wales winning 48 matches to France 43) with 1998 seeing the highest number of points being conceded by Wales with a 51-0 result. Wales biggest win over France 100 years ago 49-14 winners in January 1910. France v Galles rugby billets Only one player has scored a drop-goal in every single Championship match in 1 season .... Jean-Patrick Lescarboura (French scrum-half) achieved this feat in 1984 .... he also jointly has the record for drop-goals in one match when he kicked 3 against England in 1985. Wales France rugby tickets 2020 Sited in the beautiful city of Cardiff, the Principality Stadium is one of the greatest rugby arenas in the world with a capacity of more than 80,000. The stadium can feel very small when full, with an atmosphere that is rarely matched by other rugby union venues.